Rummle up the hale jing-bang in the boul, addin' a wee tate mulk so's ye get a dough that's stiff an' no' runny. Tim some bilin' watter oot the kettle inty the fit o' the basin an' spread the cloath (or cloot) oan tap o' the watter. Cowp the hale o' yur dough oot the boul an' oan tae the cloot in the basin. Draw the coarnurs o' the cloot the gither an' tie wi' the string. Don't tie the string too tight or the dumplin' might burst efter swellin up an' ye'll be in a helluva mess. Noo ye've a big bag o' dough aboot the size o' a fitba'. Nixt ye pit a plate in the fit o' the big poat. Then gently ye lower the dumplin' oan tae the plate. 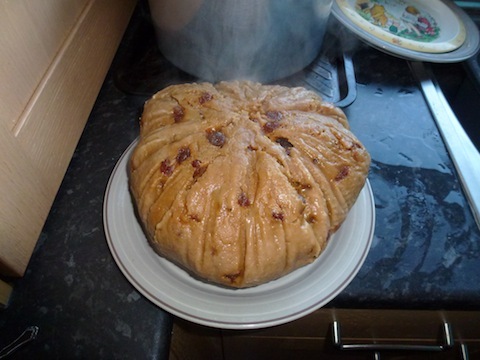 Efter that poor as much bilin' watter inty the poat as will cover yur dumplin'. Efter a' this cairry-oan ye'll mibbe waant a cuppa tea an' a fag. or even a wee lie-doon. Anyway, whitivvur ye dae, dinny let the dumplin' simmer fur mair than three-an'-a-hauf oors. Efter that time wheech it oot the poat an' oan tae a plate. Peel aff the cloot an' therr ye huv a dish fit tae set afore a dizzen Egon Thingmys. I'm sure it should be "Dinny" rather than "Don't"
I agree. Initially uploaded exactly as I was given it. Have changed it.